After what seems like months of slogging through sub-par to awful TNG episodes, I finally catch a break just before the end, with a pair of decent to great episodes to ease me into the forthcoming Movie Extravaganza, and, ultimately, the series finale. Out of this week’s pairing,“Emergence” is easily the weakest; it feels more like an episode from the second season, an interesting idea that’s more than a little undercooked, with an ending that’s less a conclusion and more a shrug. But it’s consistent in its aims, which means there’s no sudden, poorly justified twist at the end, and it’s weird enough that it’s never incredibly boring. The cast isn’t forced to betray their characters for narrative purposes. Beverly isn’t sexually assaulted by an alien. It’s the little things that make me happy these days. Speaking of little things, “Emergence” opens with what I’m assuming is a reference to the show approaching its conclusion, as Data plays Prospero from The Tempest for the benefit of a somewhat distracted Picard. The monologue Data recites comes from near the end of the play, as Prospero states his intentions to break his staff and burn his books and basically get on with his life, which isn’t a terrible sentiment to express when you’re getting ready to shut down a seven-year-old production. The scene is a nice callback to Data’s various efforts over the course of the show to develop his humanity, an arc that never really got the finale it deserved, but managed to generate many of the series’ most powerful, original moments. And maybe it’s appropriate that we never got a definitive version of Data-as-real-boy. Unless you’ve got a fairy godmother following you around, the journey to humanity isn’t one with a set or foreseeable conclusion. It would’ve been nice to spend more time with Data before the end, but given the general tenor of the seventh season (and the way that last Data-centric episode played out, with Lore and the Borg and, well, ugh, basically), maybe we’re better off this way. None of TNG’s cast would be well-served by the film franchise, but poor Data got the brunt of the damage, so it’s a relief to see him here, much the same as he always was, without any unfortunate emotional tics or painfully forced attempts at comic relief. Picard and Data have their little talk about the context of Prospero’s speech, but before Data can give it another go, the two are interrupted by a passing train. Which is, to the say the least, a little odd, and it marks the return of one of TNG’s most reliably goofy plot generators: the malfunctioning holodeck. See, something happened to the ship when the Enterprise passed through a magnetic storm (“magnetic storm” is basically just “a wizard did it,” isn’t it? ), and now various systems are acting up. Specifically, the engine takes control of itself and hits warp drive without Picard’s express command; but what’s really startling is when Geordi discovers the Enterprise’s quick jump actually saved the ship from being destroyed by a build up of theta flux distortion, a kind of disturbance the ship’s computers weren’t actually designed to detect. This has all sorts of implications as to what’s really happening—it’s not just a series of malfunctions, it’s actually a behavior pattern. But what really struck me is how weird it is that there’s a kind of distortion which can build up naturally in space, which the Enterprise isn’t normally able to detect, and which, if left unchecked, can destroy the ship. Awfully convenient the computer developed sentience at exactly the right moment to save the day. All of this is silly stuff, played as straight-forwardly as possible, and it gets sillier when Data and Geordi start finding curious nodes distributed through out the Enterprise’s internal wiring, nodes that they’ve never seen before. Data theorizes that the ship’s computer has somehow developed an independent consciousness, demonstrating a survival instinct (i.e., that sudden burst of warp speed) and sort of random whimsy you could label as the efforts of a growing mind. There is something almost unbearably cute in having the Enterprise go all sentient, as though after seven years of being forced to carry around a gaggle of well-intentioned doofuses (and Picard), the ship suddenly decided it needed to have its own adventures. I’ve never been exactly sure what people mean when they say a location is a “character” in a movie or TV show—it always seems like one of those vague phrases critics use when they’re trying to indicate a concept that can’t be adequately pinned down in words—but if you can say it about anything, you can say that the Enterprise is a character on TNG. At the very least, we’ve spent a large chunk of the series worried about her well-being, and looking for cures to her various ailments, so it’s kind of adorable that here, right before the end, she gets to drive the action rather be a victim of it. Also cute? The way the holodeck, as it has so many times before, becomes the capital of Crazyland. 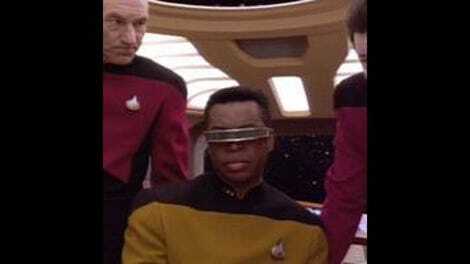 That train Picard and Data saw earlier wasn’t a singular phenomenon. Ripped off from Beverly’s Oriental Express program (sidebar: it irritates me that we learn this via a conversation between Picard and Beverly, in which he recites some facts about the Express, and she tells him he should just relax and embrace the romance of it. One of the more unfortunate assumptions of so much popular culture is that knowledge is somehow unromantic, and that true appreciation stems more from an emotional understanding than an intellectual one. Really, it’s been my experience that the latter generally leads to the former more often than not. To sum up: Beverly should have said, “Of course I know that, I designed the program, isn’t it fascinating?” and then we could’ve spent twenty minutes on train facts), the train now serves as a home to cast-offs from various other programs, each of which represents a different aspect of the ship’s burgeoning personality. When Riker, Worf, and Data enter the holodeck, they find a car full of disparate characters, from a knight in full armor, to a gunslinger villain, to an engineer, to a debutante, and so on. It’s weird and cheesy and not quite as creepy as it might have been, but close enough to be interesting. Once the Enterprise starts flying itself again, and siphoning particles from a dwarf star in order to construct some sort of device or object in one of the cargo bays, Troi decides to communicate with the ship’s consciousness. So we get some more silly stuff with a gangster and a city set, and Data stops a 1930s era taxi-cab with one hand. This is the kind of episode I always have a hard time reviewing, because while I’m watching it, I’m fine with it; but when it comes time to write anything down, I can never think of what to say. “Emergence” isn’t terrible; I wasn’t cringing or actively embarrassed at any point, but I wasn’t engaged either, because apart from the goofy costumes and weird, quasi-eerie symbolism, there’s really nothing here to get that invested in. Troi gets hit in the head by some falling bricks, but apart from that, no one’s in any real danger; obviously it’s a problem that the Enterprise is controlling itself, but it’s not an immediate problem, because the ship isn’t screwing around with life support or playfully beaming various crew-members into open space. Apart from a general sense of strangeness, the only real tension in the episode doesn’t come up until the final 10 minutes or so, when the life form the ship is trying to create is in jeopardy. Even then, there’s no real sense that the thing might die. And who cares if it does? “Emergence” spends so much time working on the symbolism on the holodeck that it never really does much with the various implications of its storyline, and that’s arguably the least interesting way to handle the central idea here. Picard pays lip service to the importance of treating any emergent life with respect and compassion, and that’s a fine idea, but there’s never any sacrifice necessary on the part of the crew to maintain these ideals. We’ve had episodes where our heroes have struggled with the difficulties raised by the Prime Directive, and the drama there emerged out of localized compassion conflicting against long-term philosophical necessity. Here, though, it’s simply, “We should get control back. Hm, I guess it may prove to be tricky. Oh look, we can actually get control and give the ship what it needs. We should probably do that!” And once this is accomplished, everything reverts back exactly to the way it was. The ship’s emerging intelligence vanishes, and the life form it put so much effort into generating (which looks like something that should be churning out sheets of candy dots in Willy Wonka’s factory) just flies out of the Enterprise, never to be heard from again. Data and Picard have a nice closing scene together, but it’s hard to shake the nagging sensation that nothing really happened here. Which is fine, not every episode needs to feature some titanic struggle and the collapse of the status quo, but it would’ve been nice if there’d been something approaching stakes in a storyline which ostensibly had thousands of people wake up one morning inside the belly of an unknown beast. Still, it was generally okay, and could’ve been considerably worse. Most adorable moment in the episode? Probably when everyone on the train started drinking champagne after the ship completed its mission. Politically, TNG has never been a daring show. Sure, we’ve touched on hot-buttons issues dressed up in science-fiction tropes from time to time, and we’ve seen our fair share of hateful bureaucrats getting in the way of letting our heroes do their job, but if you were to leave the series with an almost uniformly positive impression of the Federation as “good guys,” I’d be hard pressed to argue. That’s one of the main reasons why Firefly is structured the way it is; having the Federation-like Alliance serve as a force of control and a source of potential danger for the heroes was Joss Whedon’s way of undercutting the rah-rah-hegemony vibe of the Trek franchise. (It was also a way to mimic the classic Westerns trope of a former Southern soldier trying to survive a post-Civil War world, without calling up any of Johnny Reb’s unpleasant connotations.) From what I’ve heard, Deep Space Nine does some undercutting of its own, and I look forward to seeing how that plays out, but for right now, everything I’ve seen has led me to believe that Starfleet is just peachy. I may have my suspicions (mostly due to the show’s tendency to portray any culture that outright opposes the Federation as villainous), but that’s all they are. It’s odd, then, that the series’ penultimate episode goes to such lengths to inspire sympathy for those outside of Starfleet, to the point where the episode’s climax features a major recurring character betraying Picard’s trust. Odder still, it’s pretty clear that the episode wants us to believe she made the right choice. “Preemptive Strike” is a challenging piece of work, and often an unsettling one, forcing us to look at Captain Jean-Luc Picard—ostensibly the most trustworthy character on the entire ship (I think I’ve used this phrase before, possibly in reference to Data, so let’s just call it a tie)—as well-intentioned but misguided obstacle in the path of Ensign Ro becoming who she really wishes to be. The episode doesn’t insist we take this view, and Picard never becomes outright villainous or cruel, but we spend considerably more time with Ro, watching as she comes to realize she’s finally found the place where she belongs. In a way, “Preemptive Strike” plays like a much smarter, much more effective version of “Journey’s End,” where Wesley realized his true destiny was to hook up with Lurch and go planet-hopping. Like Wesley, Ro meets a wise old man who helps her feel like her life has meaning again, and like Wesley, Ro is forced into a position where in order to follow her beliefs, she needs to disobey orders from her superior officers. But where “Journey’s End” concluded with a lot of hugging and smiling, the last shot of “Strike” is Picard, stone-faced, staring off screen. It’s one of a handful of TNG final scenes which isn’t inherently optimistic or accepting, and there’s something shocking about that. “Preemptive Strike” isn’t just a better episode than “Journey’s End” because it’s not inherently ridiculous; it’s also honest enough to admit that sometimes, you have to go against the people you care about. And when you do, there’s no guarantee your relationship will ever be the same again. How did we get to this point? Why, trouble with the Cardassians, of course. It’s all political and complicated and whatnot, but basically, everyone’s supposed to be at peace, but the Cardassians keeps pulling nasty tricks on Bajoran settlers to drive them out of disputed territory, and in response, a group of Bajoran fighters calling themselves the Maquis have banded together to defend their people. Lately, the Maquis have decided to switch from defense to offense, and have started attacking Cardassian freighters. This doesn’t sit well with the Federation, because however sympathetic they might be to the Bajorans, they’ve got a treaty with the Cardassians to protect, and the Maquis’ actions could upset that treat. (I suddenly realized, if I’m going to cover DS9, I’m going to have to get a lot more comfortable summarizing complicated, somewhat metaphorical political issues.) So Starfleet decides they need to take action to shut down the Maquis, and they want Picard’s help to do it. Of course, they’ll also need someone on the inside, and for that, they’ll need Ro Laren. Another curious element of the this episode, when considered in terms of its placement next to the series finale, is the way the hour is largely devoted to Ro, first re-introducing her to the Enterprise, then watching her as she integrates herself into the Maquis and is slowly won over by their cause. There is absolutely nothing wrong with this, and it’s a key part of the episode; if we’d spent our time with Picard and Riker as they fretted over their lack of regular reports, and the growing doubts about Ro’s reliability, this would’ve been a decent but probably less complicated and interesting story. And yet, as a fan of TNG who has come to have a lot of fondness for the entire ensemble, I can’t help feeling cheated at seeing the show’s next-to-last episode focus so little on the main characters. Equally as curious is how the shift in focus serves to make the series’ regular leads come off as a little less heroic than they normally do. There’s Picard’s obstinacy, for one, but the few moments we get with Beverly and Troi make both women seem somewhat foolish, pampered and naive women who don’t understand the challenges of the real universe. Even Riker, for the five minutes we see him, comes off as something of… well, not a buffoon, not exactly. (I appreciate the episode’s subtle indication that Riker respects what Ro does, even if Picard doesn’t.) But his “loyal soldier” behavior makes him look a little naive. It’s not that I mind being made aware that these characters are more complex than we normally realize, but to get that knowledge so close to the end, without any chance for it to expand or affect other episodes, is a little disappointing. That doesn’t take away from what this episode achieves, however, and while it doesn’t always feel like a TNG ep, it still holds up quite nicely, tricky morality and all. I especially appreciated the careful way “Preemptive Strike” re-establishes the relationship between Ro and Picard, her clear gratitude to him for all he’s done for her career, and his trust in her abilities and her loyalty. There’s nothing exactly romantic going on between them, and that’s for the best, but the chemistry between Patrick Stewart and Michelle Forbes is phenomenal. Late in the episode, Ro and Picard meet in a bar to exchange information. It’s a conversation that starts pleasantly enough; to hide what they’re talking about from prying ears, the two pretend to be a prostitute and prospective client, which means a lot of touching and lot of whispering in each other’s ears. Picard doesn’t realize it at first, but Ro’s doubts about her mission, after meeting all the kind, noble folks in the Maquis and watching a Cardassian shoot one of them down, have solidified, and she wants to call off a planned trap. The scene plays almost like a break-up, or a lover realizing his partner has had an affair. 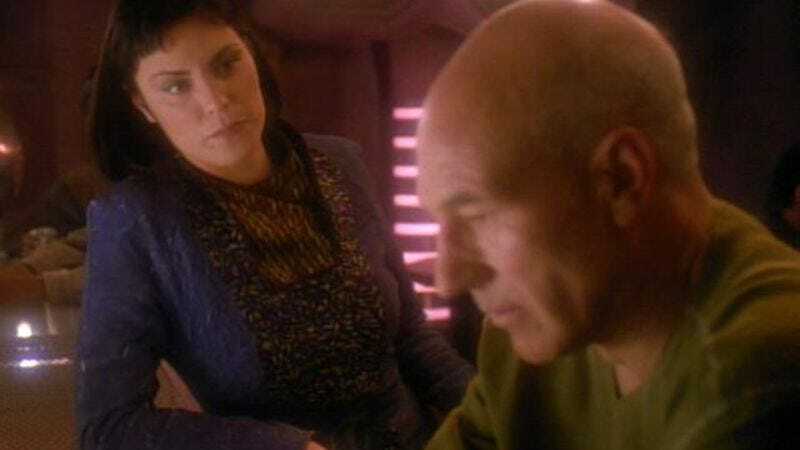 It’s not perfect; Picard’s refusal to listen to Ro’s doubts and his determination to have the mission go through as planned (even to the point of insisting on Riker being present to make sure she doesn’t try and back out) seems out of character for someone as resolutely humanist as Jean-Luc tends to be. But while it may not sit entirely comfortably within the context of the entire series, as a scene on its own, and working within this episode, it’s terrific. Really, this whole episode is great, and if this is the sort of complexity I can look forward to in DS9, I’ll have my work cut out for me. There are quibbles, because hey, I wouldn’t feel comfortable if I wasn’t able to poke a few holes here and there. Macias, the older Bajoran who helps convert Ro over to the side of the Maquis isn’t the subtlest of archetypes, and we’re never given much sign that his Andy Griffith routine is a ruse designed to earn people’s trust (I don’t mean it has to be a ruse, but he lays it on a bit thick either way). The fact that Macias dies is an overly convenient way to remind Ro that the Cardassians are evil, and I’m not sure how smoothly her plan to defect will work out in the long run. If the Federation wanted to be pissy about it, they could spread the word that she was a double agent, and given her record in Starfleet, some of the rumors would stick. But hey, that’s her worry, not mine. Again, though, quibbles, as are my comments on the placement of the episode in the season’s overall order. It’s heartening to see TNG manage such an accomplished hour right before the end, one that builds on established relationships and moves in ways we don’t expect. That may be the biggest shock of all, really. Trek has trained us over the years to have faith in the system, to believe that every wayward soul can find his or her way back to society if they choose to—and, unless they’re actively evil, they always choose to. Only here, we have someone we have every reason to trust, someone who’s proven her basic decency and strength in every episode she’s been in, and she turns her back on what we thought were the good guys. Not because she’s evil or misled—at worse, you could say she’s misguided, but I have a hard time believing that. “Preemptive Strike” leads us to the inexorable conclusion that sometimes, there is no easy answer; sometimes, whichever way you chose means hurting someone you trust. It’s a difficult lesson to learn, but an important one, and it makes for a moving, uncompromising hour. Well, this is the last appearance Ensign Ro Laren makes in the Trek universe. Too bad, really; the character would’ve been fun to revisit a few years down the line. I have to tell you, the fact that this feature is ending keeps hitting me at odd moments. I’ve been writing these reviews for nearly two years now, and it’s hard to remember what my work schedule was like before I had to remember to make room for a double dose of Picard and his merry band each Thursday. I’m not sure how to feel about this. On the one hand, it’s not a huge deal. On the other hand, it sort of is. Ah well, maybe I should just stop thinking about it so much. Next week: I suffer through Star Trek: Insurrection for your pleasure.